About half a year after Google and Apple being criticized or sued for logging cell towers and WiFi routers to improve their location based services, RIM, the maker of BlackBerry Smartphone, decided to launch its WiFi Geo-location service for developers. According to BlackBerry official blog, the services was launched on on September 9th, 2011 to provide a quick and accurate fix for location based apps. Google has been using street view cars and Android to collect cell phone towers and WiFi access points for a long time to build its location database after Skyhook pioneered this field. Later Google Maps and Google Earth all come with a feature called my place, which can pinpoint a location without GPS quickly. This web-based service requires mobile internet and is less accurate than GPS, but it works great indoors and in places where GPS signal is weak or not available. Another cell phone giant Apple also used its iOS devices to record base stations and WiFi hotspots, and Apple even got sued for tracking and storing user whereabouts although it claimed it intended to use it to improve its location based services. Although Apple continued to integrate Google Maps into their handsets, soon or later it will launch its own mapping service. Microsoft, who developed Windows Phone 7, was said to be logging and store such data as well. 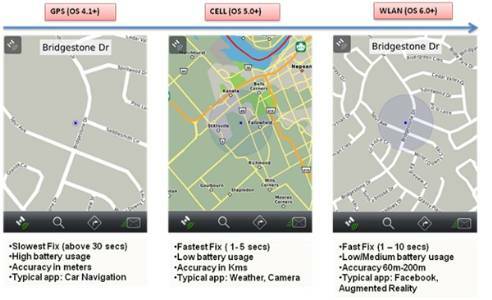 Since its main competitors all got their own location services, RIM seemed to be left behind. Only a year ago did RIM roll out its cell towers based geo-location service, which Google has been using for a very long time in its various products like Google Latitude, Google Maps etc. RIM WiFi geo-location API was introduced together with its new OS BlackBerry 6, all devices running BlackBerry 6 or higher can leverage this service.